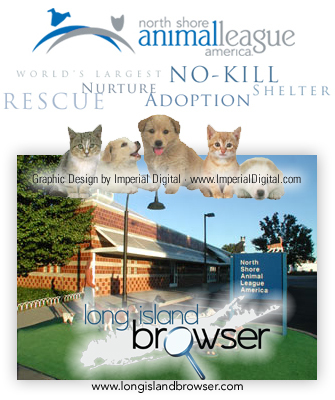 North Shore Animal League America in Port Washington, Long Island, New York, is the largest no-kill animal rescue and adoption organization in the world. North Shore Animal League America has placed close to 1 million puppies, kittens, cats and dogs into carefully screened homes. The Animal League has saved over 1,000,000 lives. As the world's largest no-kill rescue and adoption organization, we understand that a rescue isn't complete until each animal is placed into a loving home. Our innovative programs provide education to reduce animal cruelty, and advance standards in animal welfare. Our staff and volunteers work tirelessly in the pursuit of our vision of a world where all companion animals find permanent homes to end euthanasia. Tags: North Shore Animal League America, NSALA, North Shore Animal League, Long Island animal shelter, Long Island animal rescue, Long Island animal adoption center, dogs for adoption, cats for adoption, dogs, cats, puppies, kittens, animal league, New York adoptions, adopt dog, adopt cat, north shore, adopt a pet, pet adoption, LI, NY, adopt dogs, New York puppy, adopt pets, Long Island puppy, Long Island dogs, foster a pet, foster a dog, foster a cat, foster a kitten, foster a puppy, special needs pets, help special needs pets, help special needs dogs, help special needs cats, Port Washington, Nassau County, Long Island, New York.